Custom Mood Pencils Personalized in Bulk. Promotional, Economy. Budget Prices in USA and Canada. Changes Color by the Heat of your Hand! 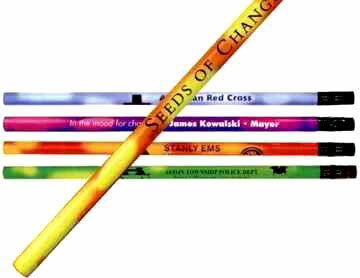 Bulk personalized mood pencils with heat sensitive surface: they change color with the heat of your hand. Quality wood pencil, made in USA, with #2 black lead (standard lead for pencils), black eraser and large custom imprint area: up to 5 lines of text are allowed. Free artwork design. We will send you a proof for your approval before production. Lowest price for wholesale personalized mood pencils in the USA and Canada. American clients pay no taxes. Unit Prices below include your 1-color custom imprint. Multi-color imprint is not available. Setup Charge: $25.00 per imprint color. Black is recommended. Exact PMS Color Match: $40.00 (cannot guarantee exact match on colored surfaces). Pencil Sharpening: $20.00 per 1000 or less. It may cause lead dust in carton. Production Time: 5-7 days after art approval; 2-day rush production is available: add $0.10 per mood pencil. Please multiply all US prices by 1.30 (only 10%). Body Heat Activated, Heat Sensitive: it changes color by the heat of your hand. Packaging and Weight: 250 per box of 13 lbs (unless 144 is specified); 12 pack cardboard band, 4.5" long, is available: add $20.00 per 1000 or less.